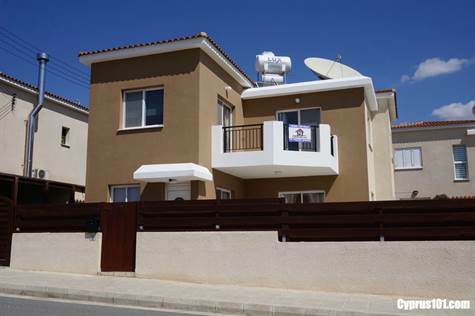 Chloraka Villa in Paphos District – This impressive 4 bedroom detached villa is situated in a quiet residential area of Chloraka within easy walking distance to amenities. The property is spacious throughout and has good modern finishes with many extras such as double glazing, air conditioning, provision for central heating, fly screens, ceiling fans and much more. The ground floor accommodation features a comfortable lounge, good size dining room, guest cloakroom and large kitchen/breakfast room. The fully fitted kitchen has plenty of cupboard and worktop space. Appliances include built-in oven, electric hob and extractor fan, fridge/freezer, washing machine and there is space for a dishwasher also. A marble staircase leads up to 4 good size double bedrooms all with fitted wardrobes. The master bedroom has a modern en-suite shower room and there is a family size bathroom accessed directly from the landing. A curved shaped balcony with distant sea views can be easily accessed directly from the master and second bedroom via patio doors. The outside leisure space has been well designed with low maintenance in mind and includes two separate covered verandas accessed directly from the kitchen, lounge and dining room. There is also lots of open terrace space surrounding the kidney shaped swimming pool for sunbathing and relaxing. Additional features are a wonderful stone feature well, fully tiled pool shower and large external store room. This lovely fully furnished home certainly represents excellent value for money and is ideal as both a permanent or holiday home.